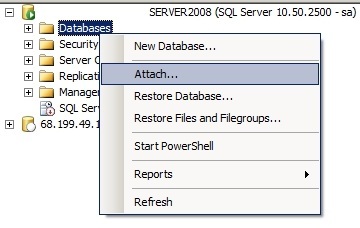 Step by step procedure of how to move MSSQL Server Express App_Data files to SQL Server 2008 R2. Current environment settings are MSSQL Server Express and SQL Server 2008 R2. This particular move process is done on the MVC Music app sample from Microsoft, but it works the same way on any Web application. Make sure that Application is not open VS2010 in my case – no handles on the files to be moved. One database has to two files ( MDF and LDF). 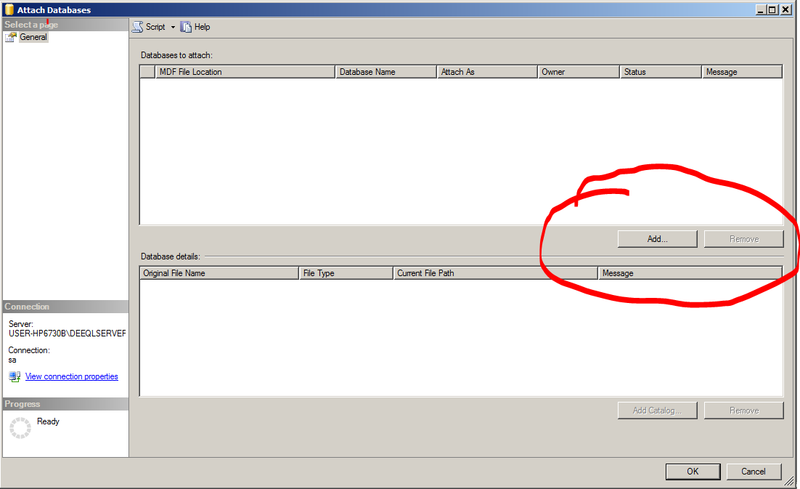 Next step is to go to the target folder where SQL 2008R2 stores data base files. Open SQL Server Management Studio. Download it from here if you don’t have it installed. Connect to the target server with the appropriate username and password, preferably the sa password. On the next pop up window by selecting Add. At this point stop the service of the 2 instances MSSQL server 2008 R2 and MSSQL Server Express. C:\Program Files\Microsoft SQL Server\MSSQL10_50.DEEQLSERVER2008\MSSQL\DATA . Click on the MDF file name to be attached. When the attachment process is done Click OK. The name of the attached database is the file path, rename to a better one. First part is done. Now we have to change to web.config file. Note Line 4 and 5. Below the new connection string. Pay attention at line 4, 5, 7, 8, 9, 10. Here I share some of my thoughts about current trends, I hope you're in the process of finding something useful here. My latest updates can be found on twitter Click on it to follow me or you can subscribe RSS.